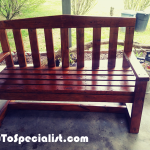 This step by step diy project is about 2×4 bench plans. 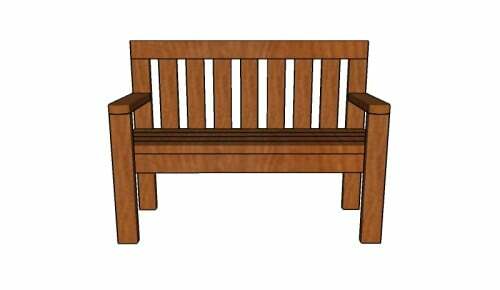 If you want to build a beautiful wooden bench with backrest for your garden, using just 2x4s, we recommend you to check out this project. Any person with basic woodworking skills can get the job done in just a few days. 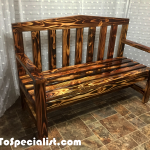 Don’t forget to take a look over the rest of the indoor and outdoor projects and to adjust the design and size of the bench to suit your needs. 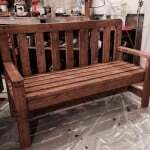 You should always plan everything from the very beginning and to adjust the size of the bench to your needs, while you can still use the woodworking techniques described in this project. 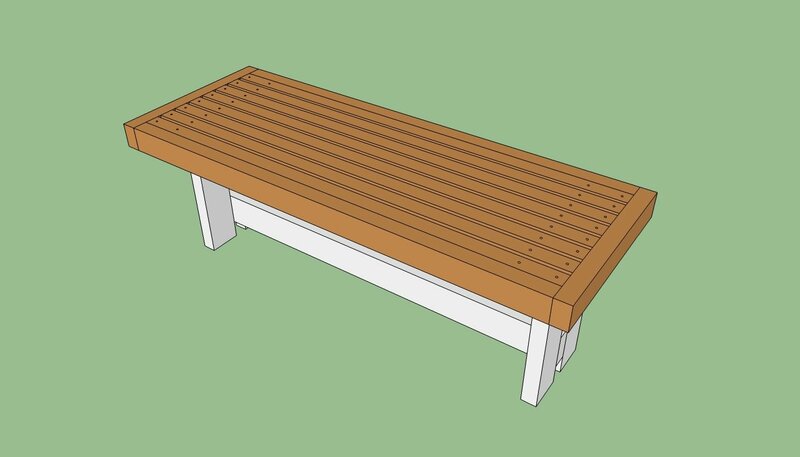 Taking into account the simple design, this outdoor bench can match the style of any backyard. Mark the cut lines on the slats before making the cuts and use a jigsaw to get the job done. The first step of the project is to build the frame of the bench. Cut the components out of 2×4 lumber at the right size, using the information displayed in the diagram. Drill pocket holes at both ends of the short components and secure them to the perpendicular slats using 2 1/2″ screws. Add glue to the joints and make sure the corners are right-angled. Next, you need to attach the 2×4 legs to the frame of the bench. Cut the components at the right size and drill pilot holes through the components before inserting the screws, to prevent the wood from splitting. Use 2 1/2″ screws and use a spirit level to make sure the seat is horizontal and the legs are plumb. Fit the stretcher to the bottom of the wooden bench, in order to add strength to the structure. Drill pocket holes at both ends of the braces and secure them to the legs using 2 1/2″ screws. Drill pocket holes at both ends of the stretcher and secure them to the braces using 2 1/2″ screws. Smart Tip: Add glue to the joints and make sure the corners are right-angled. Leave 4″ from the ground to the braces. Build the seat out of 2×4 lumber. Drill pilot holes through the slats and secure them to the frame using 2 1/2″ screws. Place the slats equally-spaced, in order to get a professional result. Smart tip: Place a piece of wood/plywood between the slats to get even gaps. Build the armrests out of 2×4 lumber. Use a jigsaw to round the end of the components and smooth the edges with fine-grit sandpaper. Drill pocket holes and secure the component to the back leg with 2 1/2″ screws. In addition, drill pocket holes at the top of the front legs and secure them to the armrests using 2 1/2″ screws. Build the top of the backrest out of 2×6 lumber. Mark the curved cut line on the slat and get the job done with a jigsaw. Smooth the edge with fine-grit sandpaper. Drill pocket holes at the top of the back legs and secure them into place using 2 1/2″ screws. Add glue to the joints and remove the excess with a damp cloth. 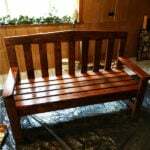 Building the backrest for the garden bench is a straight forward process, if you follow the following instructions. Cut the slats at the right size and drill pocket holes at one end. Fit the slats to the structure, equally-spaced, and lock them to the seat frame using 2 1/2″ screws. Insert the screws through the top ends into the top slat. Add glue to add strength to the bond of the components. You can easily adjust the width and the design of this bench to suit your needs. This project is very simple to build, making it ideal for a beginner to woodworking. This also makes for a wonderful gift for the loved ones. Smart tip: Apply a few coats of stain or exterior paint to the components, in order to protect them from decay and water damage. 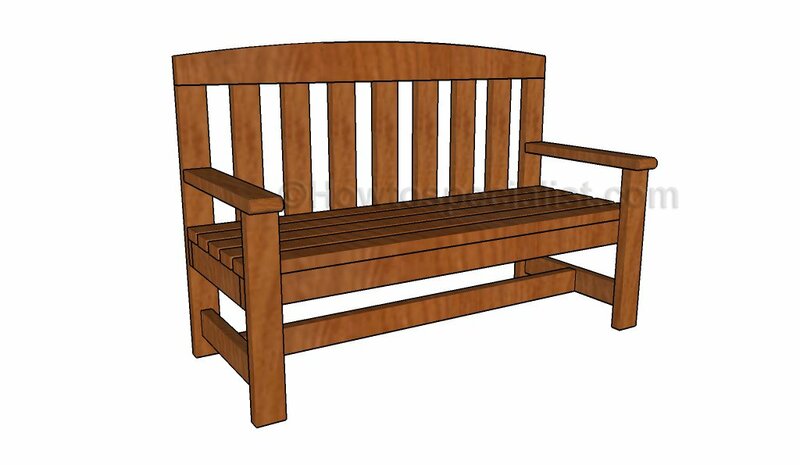 Check out the rest of the outdoor furniture plans featured on our website. If you liked the design, you should take a look over this step by step tutorial project. This bench is built entirely using 2x4s but it is a little narrower. However, all the techniques used are similar to the ones required for the plans shown above. 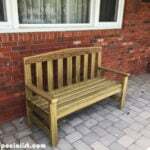 Thank you for reading our project about 2×4 bench plans and we recommend you to check out the rest of the projects. Don’t forget to SHARE and LIKE our projects with your friends, by using the social media widgets, if you want to help us keep adding free woodworking plans. Hi there….just wondering how many 2×4’s i’ll need to make this. It only says one up top. thanks bunches! I am almost finished. As I’m a newbie, not sure but I ended up needing 11/ 2×4’s. First ever project. Really enjoyed it. Thanks bunches Jack!! i’ll post a picture when she’s all done!! This bench looks like something I can do. I try to be handy and it looks easy enough. Looking forward to seeing how your bench comes out! Nice looking plan….thanks for it. One question – how do you mark the arc for the rounded top? Unless my math is off here it’s going to take more like 11 8 foot 2×4’s. Even if you don’t have any waste and the saw literally eats up no wood on the cuts the total inches add up to 918″ or 76 1/2′. That’s 9 1/2 2×4’s. It looks like a good plan and won’t stop me from making it, but it’s going to require at least 10 boards. You are right, Jeff. 10 pieces of 2×4 and 1 piece of 2×6 lumber. Or 11 pieces of 2×4, if you don’t want to use the 2×6 for the arched backrest top. Good luck with the project and let me know how it comes out. I am coming up with 11 2″x4″x8′ pieces for the bench for 2″x4″ cuts part. See the cut plan below. How do I reduce it to 10 pieces. Can someone share their cut plan? Sorry for the formatting. I built this in Excel with color coding, but the pasting option will not allow that picture. i used 11 pieces, couldnt figure out how to do it in less but i always buy one extra! i often… well often enough, mess up something. a couple of hints… make the pocket holes in the arms (part that attaches to back leg) the back and front leg at the top on the back, and all the back pieces all at once (along with the frame ones). it makes it easier doing them together. the ones on the front legs have to go on the front side, not hidden well, due to location, but if you do them before attaching the legs in the first part, it is easy… although, i would have to use a shorter driver than my drill. Just finished It! I took one or two short cuts based on my resources but the plans were great, just submitted my pics, thanks again! Thank you for sharing, Moe! It looks really well. I love how you managed to build it, even if you don’t have a lot of space for a proper workshop. Looking forward to seeing you next builds! There are some jigsaws that can cut that deep (clamp it tightly in place before making the cut). I’m not sure if that is the case for you. You should also consider using a router with a round over bit. is it better to paint the 2x4s before putting the bench together or you do the painting after? also what kind of preservative do you use to protect the wood? It is better to paint them before the assembly. I could not get all the cuts out of 10 8′ 2×4’s. I used 4 different cut calculators online to see if there was a better way, none of them could do it with 10. It has to be 11 2×4’s, plus the 2×6. Good plans otherwise. After finishing assembling my first of 2 benches, I have another tip to offer up. If you plan on using any cushions on this bench, make the front legs an inch or two longer. This will raise the armrests up just a touch, and makes all the difference with cushions. I just completed this project. It was my first one from this site. This is one of the first things I’ve ever made. It was a gift for my wife on our anniversary this month. Love the plans. Only problem I had was putting pocket holes on front legs to attach arm rest. This needs to be done before attaching front legs. Also you are not going to have room to screw them in because of base and slats. At the top of the front and back legs, so you can secure them to the armrests and to the top backrest support. So on the back of the legs just above the items you want to attach? I apologize, I am new to this whole pocket hole thing. I built my first project using them last week. I get confused on where to put them. 2nd question. What kind of wood would I need to buy since this bench will be outside? Cedar, if you can afford. If not, go with pine and use some outdoor stain and poly. Drill the pocket holes at the top of the back legs the screws will go through the legs into the horizontal backrest support. Since my grandfather is elderly I’m thinking I would need to raise the seat a little higher. He has a hard time getting up and down from a sitting position. What is your recommendation on what to move the seat height and the front and back leg heights? I can’t recommend you a specific height. My advice would be to make a few tests with your grandfather before making the cuts. If you use 2x4x10 you only need 7 and have 1/5 of the waste. 1/5 of the scrap that is. Look at E in the materials list. Use a L-square to see if the corners are square. Also check if the slats are straight. When assembling the frame lay the components on a level surface so you make sure everything is aligned. I love this bench and am in the process of making my second one. I believe I may have solved the whole 10 board or 11 board mystery. In your YouTube video you show using only three of the 18” seat frame pieces and in the instructions it uses four. I always draw out my saw plans as well and the bench used an 11th 2×4 board (not including the 2×6) only for the 18” piece and making it again this time and trying to figure out how it’s only 10 I watched the video. Being that the 18” piece was all that came out of my 11th board it occurred to me that it would indeed be ten boards if one followed the video style. If you use four braces it will use 11 boards. I’m not complaining at all! I just wanted to share what I think the difference may be. I always buy extra wood anyway and I love this plan. Wonderful detail! Thank you for the feedback. I’m looking forward to seeing your benches! I made my from cedar. wish I could post the photos. just added another bench. Not your ordinary end of bed bench, I added a small back rail. Most I have seen are just a flat bench. Thank you all. That looks awesome, Howard! Thank you for sharing… it sure is not the flat bench end of bed bench, yours has character.